Contemporary binding using 11th-century rubricated vellum leaves, in Italian Carolingian script, over boards, vellum flyleaves of the same period; rebacked in later vellum. 114 leaves; heavily annotated by contemporary hands; a number of woodcut initials (sometimes space left blank). 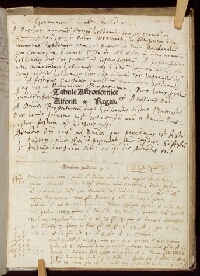 T. Helius Vitor Fanestris (Tito Aerio Vittori of Fano, signature, in a contemporary hand).